Stay/Go helps you weigh your options, make the right decision, & step forward with confidence! Sign-up today and you’ll receive an exclusive bonus offer upon launch! We all hit forks in the road that we’re not sure how to move past. The easy decisions are when the choice is between something bad and something good. But, honestly, how many of those do you face? More likely, your decision is between something good and something good (or, the ultimate tough spot… between two ‘not so great’ options). Decision making can be difficult in those moments. The good news? There is a way ahead! And it doesn’t have to be as harrowing as it feels. 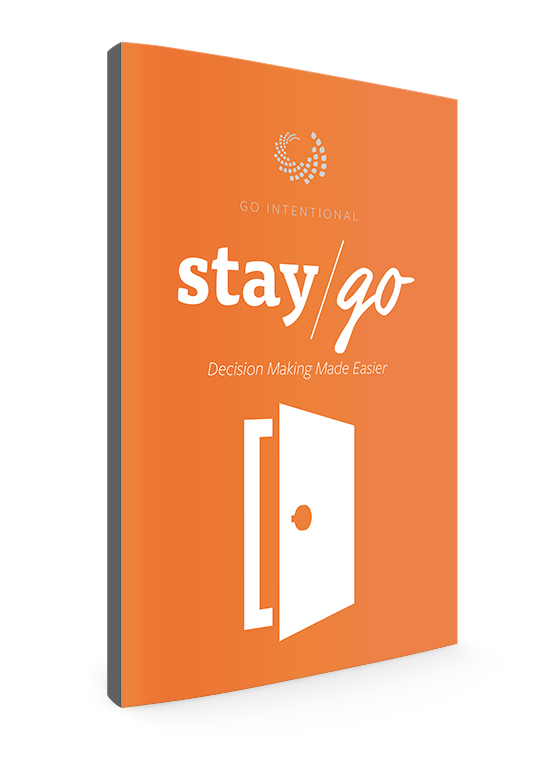 Stay/Go is a guide to help make decision making easier! Learn how to face your fears with confidence. Walk step-by-step through a proven process for making great decisions! Learn from others who have faced tough decisions and won! My name is Chris, and I’ve faced my fair share of big decisions in life. From moving locations to changing jobs, I’ve encountered any number of difficult forks in the road. We all face tough decisions, don’t we? The problem lies in the fact that when we do, we seldom know the best way to move forward. Stay/Go is a manual for helping you with just that. It’s the same decision making process I’ve used myself, and that I’ve coached many others to help them walk through these moments, as well. I know it will help you do the same! I have used this process numerous times professionally and with major decisions. The insights and clarity I gained from this exercise were extremely helpful in making my final decision with confidence. I would highly recommend investing the time in the Stay/Go formula to anyone making a major decision! This is an amazing tool which will help give you peace of mind knowing you’ve considered all the options. This process helped my wife and I think through our options as we’ve been at a crossroads recently. It has helped us not to make hasty decisions that we might have regretted and helped us gain clarity about our present and possible future. There are so many things in life that are out of our control. Stay/Go helps you be prepared for anything. It causes you to stop, slow down, examine the path you are on in your career or in your life, and discover the best way forward.